It shouldn’t have been surprising, really, that the world’s most populous continent would give birth to a movement called People Power. 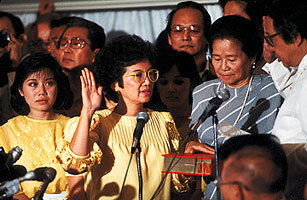 In 1986, a housewife from the Philippines whose given name meant “heart” gave lifeblood to her wounded nation. The only weapon she possessed was moral courage. But with it she discovered a groundbreaking truth: that a populace holding nothing more than candles and rosary beads could face a cavalcade of tanks, topple a dictator and, most improbable of all, usher in democracy. By the time Corazon Aquino died on Aug. 1 of colon cancer at the age of 76, People Power was so ingrained in our political consciousness that it acquired a patina of tired normalcy that hid its exceptional innovation, like electricity, say, or suitcases with wheels. Yet when Aquino led a sea of yellow-clad supporters to reclaim an election that had been stolen by strongman Ferdinand Marcos, not even the clearest-eyed political sage could have predicted that her actions would be the first crest in wave after wave of citizen-led, nonviolent movements that would reshape the world. Today, the surge of political change during that momentous era, from Eastern Europe to Eastern Asia, seems like an inevitability. Back then, it felt like an impossibility. No one was more surprised than the bespectacled widow who admitted that she didn’t even like politics and might just as easily have ended up spending her days pruning her beloved bonsai. Nevertheless, in 1986 Aquino made People Power  and People Power made the world we now inhabit a freer place. “When we were struggling with apartheid,” recalls retired Archbishop Desmond Tutu, the moral force of South Africa’s political change, “we spoke of People Power. You had to be with the people to make change happen.” At the dawn of a new century, his words may feel stunningly obvious. Yet to a planet conditioned by colonialism or Confucianism or tyranny to think that the people’s obligation is to follow, not lead, Aquino’s inspiration was truly transformative. If the purity of people power’s message remains unblemished today, its political legacy is more complicated. True, in recent years, Aquino’s quiet defiance has continued to inspire regime-changing street demonstrations, from the “Reformasi”-chanting crowds who overthrew Suharto in neighboring Indonesia in 1998 to the so-called color revolutions that catalyzed change in places like Georgia and Ukraine in the early 2000s. Like People Power, many of these movements gained momentum when the international media broadcast images of thousands upon thousands of people uniting peacefully against corrupt or cruel governments. Under the scrutiny of satellite-TV cameras, traditional exercises of power  guns, truncheons, tanks  often backfired against the force of nonviolent protest. Also like People Power, many of these latter-day protests have profited from the power of communication to mobilize. Back in 1986, some 1 million marchers who flooded the now iconic Epifanio de los Santos Avenue were summoned by samizdat radio stations that broadcast a political call to prayer. During the recent mass protests in the former Soviet bloc, it was thumbs tapping out cell-phone text messages that brought crowds onto streets. This year in Iran, Twitter and other social-networking sites have served as the carrier pigeons of incipient revolution.